PT ASABRI (Persero) - ASABRI is a reputable state-owned company in Indonesia with strong business focus on social insurance industry. Since its founding in 1971, ASABRI has business competencies in managing pension funds for the members of Indonesian Military (TNI), Indonesian Police (POLRI) and the Civil Servants (PNS) in the Ministry of Defense (Kemhan). ASABRI is a non listed state-owned company and is fully-owned by the Government of Republic of Indonesia. As of December 2016, ASABRI has served by 34 office networks spread in all over Indonesia, served by 501 employees. Its office networks comprise of 1 main branch office, 12 branch offices, 20 sub branch offices, and 1 special service unit. ASABRI's head office is registered at Gedung PT ASABRI (Persero), Jl Mayjen Sutoyo No 11 Jakarta 13630. In the business year of 2016, ASABRI recorded a satisfactory performance growth. According to PT ASABRI (Persero) Annual Report 2016 as cited by JobsCDC.com, ASABRI recorded total revenue of Rp 5,182.61 billion in 2016. This number reflected an increase by 24.26% from Rp 4,170.74 billion in 2016. ASABRI successfully recorded a total profit of Rp 537.62 billion in 2016, increasing from Rp 346.71 billion in 2015. Male, maximum age of 35 years old (single/not married). Background in Bachelor or Master Degree (S1/S2), majoring in Finance Management and Human Resources Management. Have no marital or blood relationship with the employees and / or directors, and / or board of commissioners ASABRI. JobsCDC.com now available on android device. Download now on Google Play here. Please be aware of recruitment fraud. The entire stage of this selection process is free of charge. 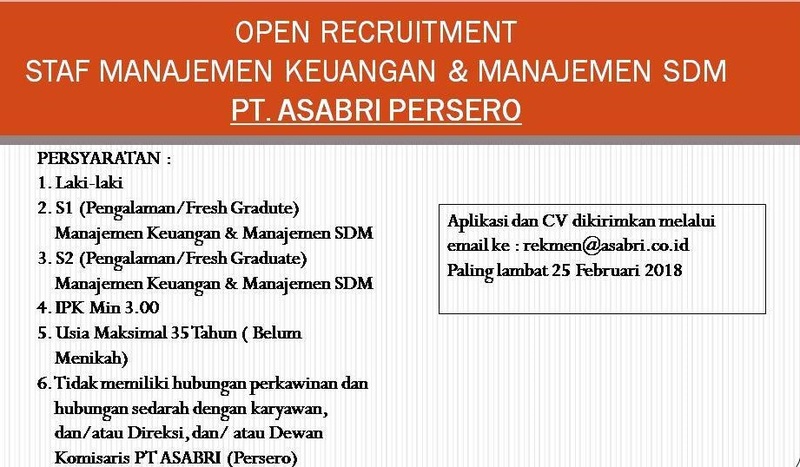 PT ASABRI (Persero) - S1, S2 Fresh Graduate, Experienced Staff ASABRI January 2018 will never ask for fees or upfront payments for any purposes during the recruitment process such as transportation and accommodation.